Tickets on sale now: click here to order. Join us for three days of fantastic folk music on the beautiful Gower Peninsula. The festival usually takes place on the second weekend in June, which in 2019 will be 14th to 16th, and is again being held at Weobley Castle Farm. This working sheep farm lies on the edge of the tidal salt marshes of the north coast of Gower. 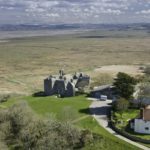 At the heart of the farm is a 14th Century Castle with panoramic views of the Loughor Estuary stretching out towards West Wales. Camping facilities are available on site making for an easy transition from sleeping bag to festival activities. Refreshments will be provided by Chris and Emily Mabbett (proprietors of the popular Rake and Riddle in Penclawdd), including real ales from the award winning Gower Brewery. 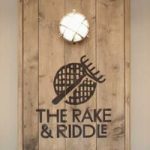 The Gower Folk Festival together with partners The Rake & Riddle and Weobley Castle Farm offer good food and drink, a spectacular venue and of course the excellent music! This project has been part funded by the Welsh Government Sustainable Development Fund.